Peaches & Cream actually gives two different sweet flavors in every bite. It matures early in the season, grows to 6 ft. tall and has 8 1/2" long ears. The pretty bicolor kernels are borne in 18-20 rows. A popular favorite. Corn, Peaches & Cream Hybrid is rated 3.5 out of 5 by 16. Rated 5 out of 5 by Sodbuster1 from Super purchase Planted this corn since late 1990's, never in my mind would I need to try another type. Last year I purchased my seed through Burpee's here and my germination rate was in my opinion 100%, counted 199 plants out of the 200 seed count pk. Don't know if there were 200 seed's there, but I was sure satisfied. 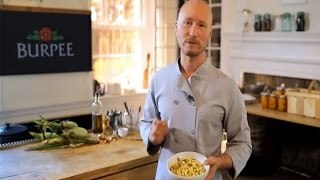 Ate about 2dz ears and also put up 96 cups of corn in the freezer, cut off of the cob . Can't go wrong there my friends. Rated 5 out of 5 by Figi from Corn I planted peaches & cream in early spring. I live in zone 9 it came in a little slow but it made up for it. I had a lot of people stop by and wanted to talk to me about my corn I planted it by the road . They would say to me how beautiful it was. Never seen corn grow so fast and the deep green color. 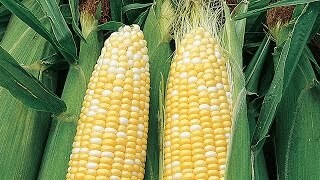 It is a good tasting corn sweet and juicy .My hole family enjoy it. Rated 5 out of 5 by kljh1969 from Wonderful, hardy corn! My husband and I planted 6 rows of peaches and cream. Just as the silk was starting to show, we had a tornado pass through. It completely destroyed out 70ftx40ft garden. The stalks where actually lying in a swirl pattern. We decided to see if the corn could be salvaged and stood up each stalk that wasn't broke and mounded dirt around it to hold it up. We watered and babied it daily. Low and behold the silks continued to grow and we produced enough corn to blanch and freeze for almost all winter! Rated 5 out of 5 by Sherry Walters from Peaches and cream This is by far the best tasting sweet corn I have ever eaten in my life. I get it from the farmers market. They tell me that It's the only kind they will grow. After being two generations of growing corn. I bought it and enjoyed every bite. I plan to grow this corn next year in my garden. Rated 1 out of 5 by Momofsons from Huge disappointment!! Great germination and it produced a lot of corn, but the taste was not at all sweet. Will be purchasing a different variety next year. Rated 1 out of 5 by SAM1 from Peaches and Cream--a Big disappointment! Only about half the stalks put out silks. The rest of the stalks had only one ear per stalk. The ears were 5-6 inches long, not 8 1/2, as stated by Burpee. We live in an area with a short season and have to be creative to grow corn (using plastic early to lengthen the season). We waited all summer for the payoff. Bummer. I hope the other two varieties we planted are better. Peaches and Cream took 77 days to maturity (not 70), and the summer has been plenty hot enough for corn. Rated 4 out of 5 by cjgonwhiteman from Good out come so far So far I have had nothing but good from these. 4 out of 5 came up and they are growing fast. I do not have any corn from them yet but I am excited and will update when I do!